Technology Holdings is pleased to announce the sale of our client, Syncordis to LTI, a global technology consulting and digital solutions provider which is part of the $17B Larsen & Toubro Group. Syncordis is a leading banking and financial services IT company with a presence in Luxembourg, France, UK and Chennai, India. Syncordis is one of Europe’s leading core banking and Temenos Digital Banking implementation service providers, with blue chip banking clients and has developed industry leading accelerators to enable faster implementations. Technology Holdings was the exclusive advisor to Syncordis on the transaction. Syncordis has an exclusive focus on the Temenos core banking platform and is the leading independent pure play Temenos specialist in Europe. Syncordis’ deep expertise in banking and financial services and Temenos implementation skills will assist LTI with expanding its capabilities in banking. 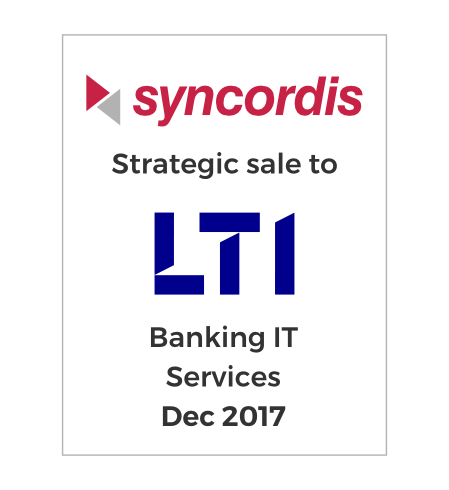 Syncordis’ deep domain expertise and local market knowhow helps LTI address the rapidly growing market opportunities for core banking product modernization services. Syncordis’ strong presence in Europe, a growth market for LTI, brings strong synergies. "From the time that we started working with Technology Holdings, they became like an extension of our team, managing every step of the complex process of selling a company efficiently, systematically and diligently. We were impressed by their commitment to achieve our targeted objectives, always keeping our best interests in mind, which resulted in us finding a strategic partner that was the best fit for Syncordis, its management and employees. TH's access to buyers globally across the IT solutions industry resulted in multiple strategic offers. We would certainly recommend TH to any company looking to sell."